According to ChemOrbis, Turkey’s PVC market has been trading well above the spot market in Italy since late February, defying the premium Italy usually carries above Turkey. 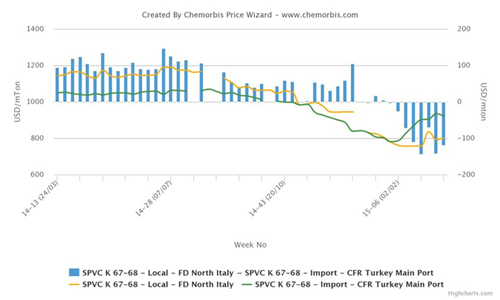 ChemOrbis Price Index suggests that Turkey’s import PVC market is now standing more than $100/ton above Italy’s local spot market on average, as can be seen from the graph below. What is more, the premium Turkey is currently carrying over Italy has been the largest since the launch of the ChemOrbis Price Index. Please visit ChemOrbis Price Index to run your own graphs for full data. You can also make comparisons for different products and regions. The current situation is due, first and foremost, to tight prompt availability which pulled Turkey’s PVC market up considerably starting from early February. While the upturn caught many Turkish buyers with empty stocks, rising feedstock costs as well as reduced allocations from the main suppliers both from Europe and the US resulted in a spike in import prices to Turkey. Second, the euro’s constant depreciation against the US dollar played a role in this large gap between Turkey’s import PVC market and Italy’s local market. The euro has been facing its lowest levels of more than 10 years against the US dollar. In addition, Italy’s PVC market started February on a bearish note unlike Turkey, where the trend reversed up, according to ChemOrbis. Although hike attempts surfaced in Italy in the latter part of February, they only evened out the earlier losses. Italy’s March business started with large hike targets in line with the monthly ethylene contracts; however, the depreciation of the euro trimmed these increases in dollar terms. Therefore, the local spot PVC market in Italy has fallen below Turkey, defying the traditional trend.